‘Nebularium’ has been remastered and the sound is more powerful than ever and the album even contain an EP called ‘The Restless Memoirs’ of previously unreleased tracks. I did a review of their 3rd studio album ‘Mind Tricks’ in 2006... an album I still love and adore so I couldn’t wait to get hands on this release. Well... I’m not disappointed. 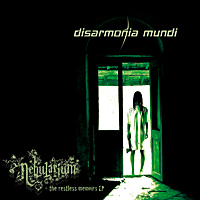 ‘Nebularium’ is not as strong as ‘Mind Tricks’... but its still a quite good album. Their music could very well be described as melodic death metal with a progressive edge and bands such as; Soilwork, In Flames and even Hypocrisy and Opeth comes to mind now and then. I’m quite impressed how well they handle their instruments and how well they arrange their songs. The shifts from pure thrashy melodic death metal to the quieter and more progressive stuff without overdoing it or losing their way. And let’s be honest; Great lead guitars also are an important element in metal, right? And here we have catchy riffs and memorable leads that will make you turn you head now and then. ‘The Restless Memoirs’ EP is more typically melodic death metal with all its trademarks; Thrashy yet catchy riffs and catchy refrains all done in the “Gothenburg way”. Now I can’t wait for their brand new album to be released but until then I will spend some more time in company with this release.